Peace is an Offering contains a strong message about what the abstract concept of peace means for the young (and old): helping one another, being kind, joining together, and enjoying all aspects of life with respect to your family, friends, and neighbors. Peace does not need to be overcomplicated or forced. Peace is the accumulation of all the small, meaningful acts we do each day. The children in this large neighborhood, make, find, and (most importantly), show kindness to each other every day in simple heartfelt ways. 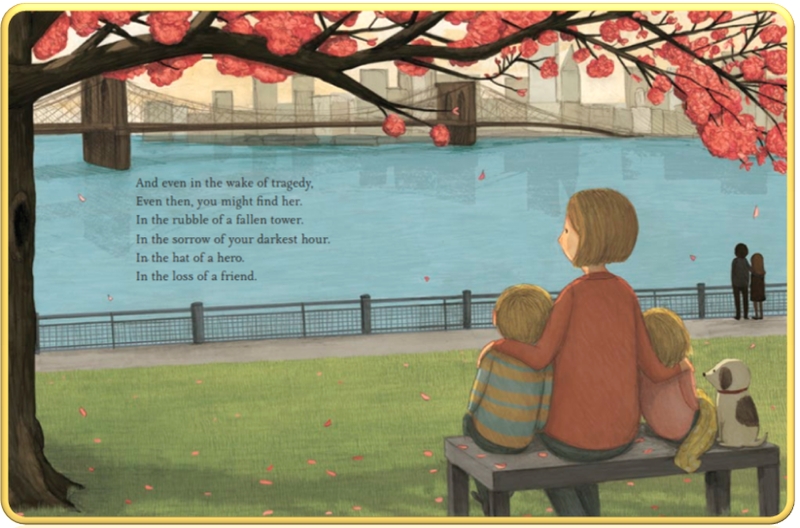 The poem is beautifully written and illustrated. Children will easily understand each deftly visualized line or verse of the poem. Multicultural children interact with each other, families spend time together, and friends stay close. What is not to love about Peace is an Offering? Nothing, though the spread alluding to 911 seems unnecessary. The verse feels out of place, as does the illustration, which deviates from the light, airy, everyday life depicted on the other spreads (see two examples here). but for those who lost a loved one or friend, the spread may provide comfort. Peace is an Offering is a gratifying read; uplifting and inspiring young and old alike. The author finishes the poem by offering advice to children. Through the long, dark night. I loved every aspect of every spread. The poetry speaks to the heart. Pencil and watercolor illustrations have those details I rave about. Simply said, Peace is an Offering is a joy to read. PEACE IS AN OFFERING. Text copyright © 2015 by Annette LeBox. Illustrations copyright © 2015 by Stephanie Graegin. Reproduced by permission of the publisher, Penguin Random House, NY. Purchase Peace is an Offering at Amazon —B&N—Book Depository—Penguin Random House. 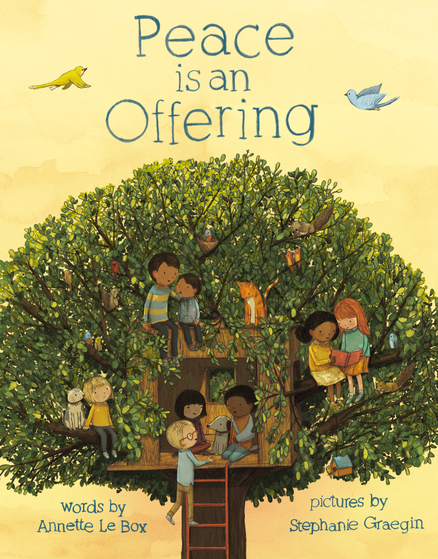 Learn more about Peace is an Offering HERE. This book looks delightful. Kindness is magic. Great review, Sue! I saw this book reviewed on another blog and I really want to get a copy of it. It’s my kind of book. Lovely review!